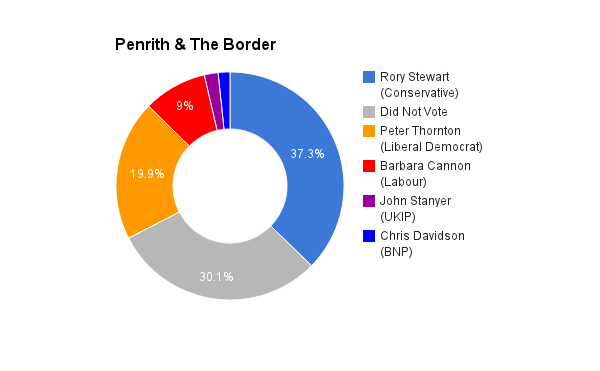 A Conservative safe but occasional marginal seat, Penrith & The Border is located in Cumbria, England. The incumbent MP is Rory Stewart of the Conservatives who has held office since 2010. I am readily accessible to my potential electorate. They can contact me at any time by e-mail, letter or phone, or by speaking to me in the street or at public events. Lib Dems are far more democratic and financially and environmentally aware than any of the other four major parties in England. We have always hypothecated all proposals in our election manifesto(s). The current Penrith & the Border MP has made himself well-known – hardly difficult when one appears on radio, TV and even the stage at regular intervals in addition to being a travel writer. However he should also be better known for the fact that he supported bombing Syria, opposed democratic reform (e.g. House of Lords) and is ambivalent about the European Union. I am aiming to make this as much spoken-about as he himself currently is.